Talen’s poor field conditions get the Deadspin treatment. Three things learned from the Union’s rough weekend loss plus three more here equal six things learned today! Check “car in the Delaware” off your MLS bingo sheets. The Union are still confident despite Sunday’s dropped points. 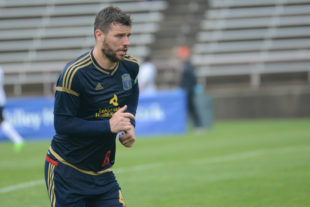 Very cool guy James Chambers talks with Adam Cann on the latest Union Pitchside podcast. The Steel will be facing a disciplined Louisville side ready to defend their title. Everything is set up for a wild Decision Day. Someone in England thinks Manchester United should bring in-form Wayne Rooney back to Old Trafford during MLS offseason. Who saw that headline coming when Rooney moved stateside? As the Union found out, Tim Parker has been very good this season. Power rankings heading into the last week of the season. U.S. Soccer Federation CEO Dan Flynn is stepping down. The U.S. U-17 Women’s National Team released their roster ahead of the 2019 U-17 World Cup. ICYMI: Konrad de la Fuente — a U.S. youth international playing for Barcelona — is catching eyeballs with other young Yanks abroad. it is a fact founded and sourced in opinion… the best game on the docket today is Ajax – Benfica. Zlatan, Rooney, huge Decision Day, 50k in Minnesota, the Union actually playing well at playoff time. Is it just me or is MLS really fun right now? I’m having a blast following the storylines each week, and it’s great having big personalities like Ibra, Rooney & Martinez. Now let’s get some playoff Doops goin! Did the car in the Delaware have a Red Bulls bumper sticker on it? ?